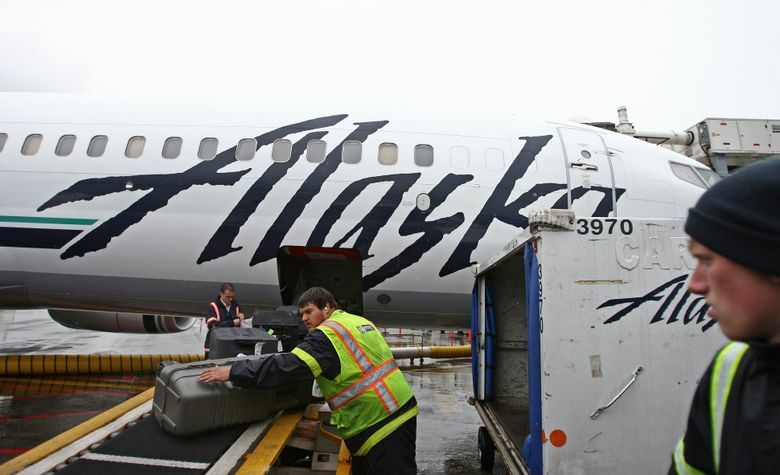 Alaska is taking its Sea-Tac baggage-handling contract away from the outsourcing firm Menzies and giving it to a new Alaska Air subsidiary. About 900 baggage handlers will now be unionized under the Machinists and will get better benefits. Alaska Airlines is taking its baggage-handling contract at Seattle-Tacoma International Airport away from Menzies Aviation and giving it to a new Alaska Air subsidiary, McGee Air Services. About 900 Menzies employees — mostly ground crew and some back office staff — will be offered the opportunity to work for McGee and will now be unionized under the Machinists union, said Cees Verkerk, Alaska Air’s managing director of station operations support. The move comes a dozen years after Alaska outsourced its baggage work to the nonunion firm Menzies, a switch that severely cut wages for its baggage handlers and eventually helped fuel the $15-minimum-wage movement when it launched its first successful initiative campaign in the city of SeaTac. The initial wages at McGee will be unchanged, but the contract with the International Association of Machinists and Aerospace Workers (IAM) union will provide better benefits and incremental pay increases over the next six years, Verkerk said. New benefits for the baggage handlers include airline travel privileges, improved health-care benefits and the opportunity to earn a monthly performance incentive bonus, Verkerk said. McGee Air Services, based in Renton, was founded a year ago by Alaska Airlines veterans, including its president, Dean DuVall, who met with groups of Menzies ramp employees at the airport Wednesday afternoon to tell them the news. He said McGee wants to create a culture that encourages high performance by recognizing the baggage handlers for the hard work they do, often out in bad weather. “Employees aren’t valued in the way they should be. They don’t get enough credit with our competitors,” DuVall said. Although a wholly-owned subsidiary of the airline, McGee operates independently and bids for Alaska Airlines work against other ramp-service providers. McGee launched at its first airport in Phoenix in July, later adding San Jose, California and Portland. “They seem like a good bunch of people that care about their workers,” he said. Menzies workers at Sea-Tac are now paid a minimum wage of $15.34 an hour as a result of the successful push that started in 2013 for higher wages at the airport. Carlson said the baggage handlers will get a 25-cent-per-hour raise after one year, an additional 50 cents after two, plus an increase in the inflation-adjustment index. They will also get paid double time for seven holidays. With incentive pay factored in, he said, a typical baggage handler in five years should earn between $18.21 per hour and $19.75 per hour. The IAM had previously represented Alaska’s baggage handlers when the work was in-house. To cut costs, the airline outsourced its baggage-handling work to Menzies in 2005, resulting in most of its ramp employees leaving and being replaced with lower-paid workers. After Menzies took over the work at Sea-Tac in May 2005, there was a rash of accidents that damaged jets on the ground and poor performance that upset passengers waiting for bags. Eventually, Menzies fixed those problems, meeting Alaska’s 20-minute guarantee for delivering bags to passengers. In 2008, a federal arbitrator ruled that the airline had breached the IAM contract with the outsourcing but did not order reinstatement of the workforce. However, Menzies still handles baggage for Alaska in many U.S. cities and Mexico and remains “a very strong business partner,” he said. Verkerk said a switch to McGee in more cities will be considered on a case-by-case basis. McGee President DuVall said the company will take it one airport at a time. “If we’re successful here, we expect there’ll be other opportunities,” he said. The name McGee comes from the early history of Alaska Airlines, which traces its roots back to 1932 when Linious “Mac” McGee, an aviation pioneer in the state of Alaska, created McGee Airways — which after a series of mergers became Alaska Airlines in 1944.